What starter Pokemon will you choose? The first choice is my personal favorite, Zoroark-GX / Greninja-GX. The deck can play aggressively, take Prizes in quick succession and disrupt their Bench. But it can also transition into a slower, more control focused late game using Greninja-GX. It provides a low skill barrier to entry, but has a moderate skill ceiling for those looking to leverage their talents. The second choice is an aggressive, consistent, hard hitting, albeit fragile take on the Malamar archetype. Early in testing, Malamar felt clunky with the loss of Float Stone. The Stadium card, Altar of the Moone, can help but it requires an extra Energy attachment in order to function, limiting the decks early game aggression. The list in this article solves the Float Stone problem; to produce the fastest, hardest hitting Malamar variant I have tested thus far in post rotation, albeit at a cost. The third and final choice is Zygarde-GX / Lycanroc-GX to round out our type triangle. I’d love to tell you my Zygarde-GX / Lycanroc-GX list provides as much power, consistency, or versatility as Malamar or Zoroark-GX, but I cannot. Fighting archetypes felt underwhelming time and time again in my testing, but I will provide the best list I worked on at this point and explain why I think the Fighting archetype underperforms compared to the likes of Malamar or Zoroark-GX. Please keep in mind that all lists provided are minimally teched. I encourage you to adapt them as you playtest and as the post rotation metagame reveals itself to us. 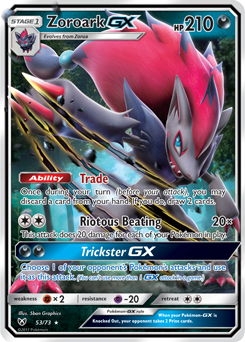 When Forbidden Light came out, everyone began testing ways for Zoroark-GX to beat Buzzwole-GX / Lycanroc-GX with Beast Ring. My teammate, Poet Larsen, introduced me to Zoroark-GX / Greninja-GX as a potential solution. 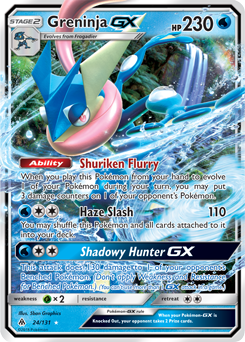 The Abilities of Frogadier and Greninja-GX allowed the deck to skip the turn they are able to use Beast Ring by taking many Prizes in quick succession and mitigate the threat of Lycanroc-GX by applying early Shuriken pressure to an energized Rockruff. The archetype stuck in our minds as one of the most, if not the most, powerful Zoroark-GX pairings. Unfortunately, the archetype simply could not execute its game plan with Parallel City rampant in the format. With Parallel City leaving the format, we can finally unleash the greatest Zoroark-GX partner into the Standard format. Before I move onto the simulated results, I played out a few hundred solitaire games with a number of search and draw engines to get an overall feel for the best optimization. I began my testing with four Nest Ball, two Lillie, four Cynthia and a simple thought: “What if Lillie outperforms Pokémon Fan Club and Apricorn Maker?” Sometimes it does, but far too often I found myself wishing I could grab some Basic Pokemon. I added a single copy of Apricorn Maker and this made games much more stable, and most importantly, less vulnerable to Zorua snipes. However, I feel like I missed out on its value by not running any Timer Ball. It did not take many games before I regretted using Apricorn Maker to grab two Timer Ball. Playing a Supporter represents a much greater commitment than playing a single Item card. If I play Cynthia, draw a Timer Ball, and flip one tails, it feels bad; but not too bad since I still drew five other cards. If I play an Apricorn Maker and flip zero to one heads, I feel like I wasted my entire Supporter for the turn. I tried running Olivia over Timer Ball. This felt much better. Searching out two Zoroark-GX on turn two feels like the optimal Supporter play. At the same time, searching out two Greninja-GX on later turns can win games. It never feels bad to see an Olivia in your hand; and I find myself opting to trade away Cynthia over Olivia so I can guarantee an explosive finish. In my final batch of physical test hands, I tried going all in on Apricorn Maker, and it ran surprisingly well. You may think running this many copies of Apricorn Maker wastes too many deck slots that you could spend on “juice” cards like Super Scoop Up, Guzma, or Acerola. But here’s the thing: when you run only a single copy of Apricorn Maker, you usually need to play Tapu Lele-GX to search it out. In a Zoroark-GX / Greninja-GX deck, every Tapu Lele-GX you bench limits your damage output by 50 over the course of a game. When you run four copies of Apricorn Maker, you can frequently fill your Bench without ever putting down a Tapu Lele-GX. Thus, the extra Apricorn Maker feel like they “juice” your game plan even if they do not directly contribute more damage output, healing effects, or gust effects to your deck. I even found myself using them in mid to late game turns to guarantee Knock Outs or Bench snipes.